Discussion in 'Science and Pseudoscience' started by Pete Tar, Sep 25, 2013. This is (in my opinion*) obviously staged, but how do I find the original use of it? I haven't watched the videos included in the article, so maybe the above photo is intended as just an artistic interpretation to lead the story and the actual soul image is in the videos. *cause you know, just in case. Still, how do I find the top image's original source/creator? Whoops, even that one isn't the one... it's from a sauna. And all the articles use that picture, so apparently that *is* supposedly the image claimed as his work. Or maybe there isn't even any photo, just the claim that he's doing it. In other cases... Korotkov has noted that "the soul" of people who suffer a violent and unexpected death usually manifests a state of confusion... and returns to the body in the days following death. Good to know he's been following people who just happen to die violently and unexpectedly. Down alley ways? Caption: MODEL RELEASED. Departing spirit. 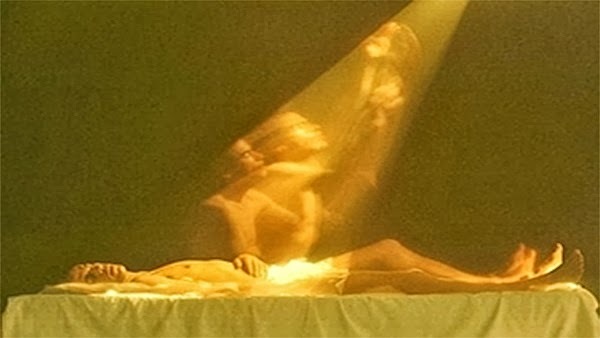 Abstract image of a young man's ghostly spirit or soul leaving his body as he lies on a bed. This change of form, or transfiguration, could represent the departing of the soul to heaven. However, it might represent the spiritual enlightenment achieved through meditation. Thanks - how did you find that? My google skill is poor. Well where's the data? This is big news isn't it? 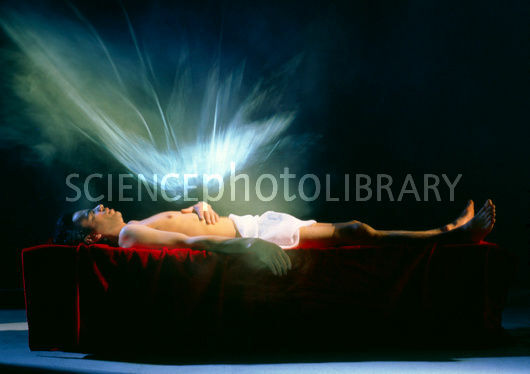 So the story 'Russian scientist photographs soul leaving body', doesn't actually have any photos attached to it, just an interview. Disappointed. Searched for the image, then clicked on "Oldest", three pages of results, the last one (presumably the oldest) with a watermark. How can you guys say this is "Debunked" when you haven't even found the original study. Professor of Computer Science and Biophysics at Saint-Petersburg Federal University of Informational Technologies, Mechanics and Optics. Professor of Research in Saint Petersburg Academy of Physical Culture, and the President of the International Union for Medical and Applied Bioelectrography. Probably a bit more advanced in his field than any of you lot who have nothing better to do than shoot down any ideas/theories or studies that you don't happen to agree with due to your materialistic western conditioning (I'm from the UK myself, born and bred in Cambridge). Such a shame that when you google this mans name, this is the 2nd page to come up... slandering a mans name and research with no evidence. Doesn't that go against your proposed purpose here? It is the photo that is being debunked here. 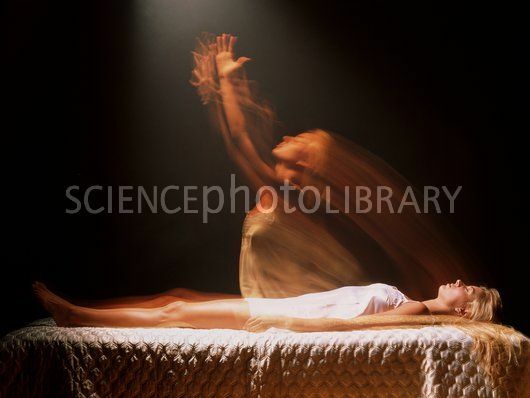 So an incorrectly used stock image used by an amateur website is more worthy of discussion than the actual proclaimed statement of evidence of the human spirit leaving the body? Guess if theres nothing better to be done, fair play to you lot.... pity this guys name is being tarnished when he has nothing to do with third-party amateur blogs. Feel free to start a new thread debunking his main claim of evidence. You must have missed the reply/thread above - the conversation was about the unrelated photos being incorrectly used in a story that has since been spread around as though it was truth, I.E. debunking. Not "tarnishing" the scientist or his studies. Perhaps his name should be removed from the thread title? As If I were him I would be threatening legal action for the removal or renaming of this thread, considering how high up it is listed in the google search for simply his name. PS. I am not trying to debunk the claim, as I have no reason to suspect it is false or fraudulent. Our current understanding of science is A. limited, and B. restricted. There is cutting edge technology and research out there that only science-fiction novelists could imagine, but the general public have no access or knowledge of it's existence and how far in advancement it really is (old benchmark used to be on average black project tech is 50 years advanced of consumer). Anyway, I think you guys would do well to look into the other world of existence, intuition, common sense, spirituality. Being consumed only with rigid, hard current-day logic is to limit your understanding and mindset to that of a computer. There is no legal action to be taken because there's no defamation occurring. In fact, if you look at it from another angle, it could be seen as trying to separate the garbage that has been attached to his name, which is still part of debunking. For example - The photos mentioned have been used to falsely represent his work and therefore make him look less credible. ...Anyway, I think you guys would do well to look into the other world of existence, intuition, common sense, spirituality. That's not what is being discussed here, and not really the purpose of this thread. If you want to debate the claims re the professors research maybe start another thread? Saint-Petersburg Federal University of Informational Technologies, Mechanics and Optics. And he is not a faculty member of it. No offense, but ~99% of the internet appears to be little more than personal prejudice passing as "common sense," etc. I come to this site largely to get beyond all that noise. odds with the "current-day logic" (as you call it) that you do not care for. Best of luck, though. This was also my question, like Pete Tar asked, and therefore I found this forum..
For "sauna" pictures I was thinking , maybe it was other way, they used original pictures of dr. Korotkov,because given link under pictures is not found.. even server is not found.. . 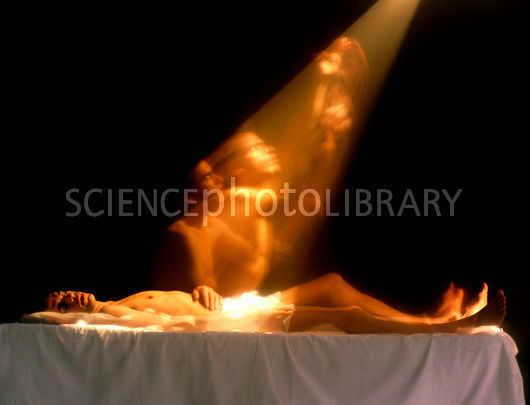 But I didn't find pictures of soul leaving body nowhere. he answered to the similar question, "where to find pictures? ", giving link which was only text about research,-no pictures. I just read the study, and I'm not sure what exactly is being claimed here. 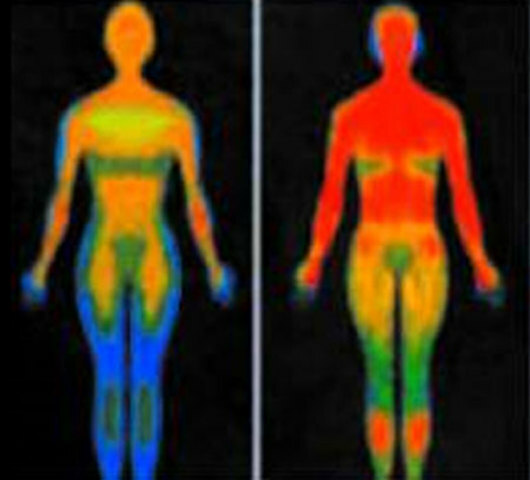 From what I can tell, he was able to detect some measurable bioelectrical activity in human bodies after death, and some of the patterns he observed in its decline appeared to corresponded to different "kinds" of deaths. That's neat, but it's hardly evidence of souls or anything supernatural. The human body, like all living things, is a tremendously complex system, with many mutually constraining physical processes taking place all the time. Many of those processes have an electrical component. Death represents the cessation of some of those processes--the ones responsible for the autopoiesis of the organism as a whole--but very many of them persist long after death. Even setting aside the activity of the non-somatic microbiome, there's no reason to think that cellular metabolism or even mitosis ought to suddenly cease all at the same time at the moment of clinical death; in fact, discovering that they did would be significantly more surprising than discovering that they do not. There's no reason to think that biological processes shouldn't take some time to "spin down," just like a mechanical flywheel after the power is turned off. That's exactly what you'd expect from a physical system. As far as the curve shape and death type correlation, I'd be very interested to see the raw data. It's not terribly surprising that (say) a death from old age would be metabolically distinct from the violent death of a young person caused by brain trauma. There are all sorts of cellular and metabolic differences between the young and old, and different causes of death might well have wide-ranging impacts on many biological processes. This topic is probably worth more exploration, as knowing more about how various systems break down after death could well have great medical applications. Death is a process--or, rather, the corruption of certain processes--not a singular, temporally distinct event. 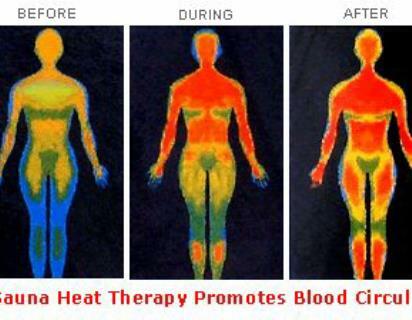 The more we know about how it works, the more likely we are to be able to stave it off. I see no reason to think that any of this implies that there's anything supernatural going on, though.